Crimes and offensive violations often happen in dark places. To keep peace and order in an area, it’s highly important for someone in the law enforcement to always be on guard. Having a complete gear makes the first step. Planning to buy one? This article helps you determine how to choose the best police flashlight. Conclusion – Which is the best law enforcement flashlight? Streamlight Stinger DS LED HL, Dual Switch Rechargeable Flashlight is a type of tactical flashlight that is handheld. Handheld flashlights are good for self-defense due to their size and durability that makes them good blunt weapons. 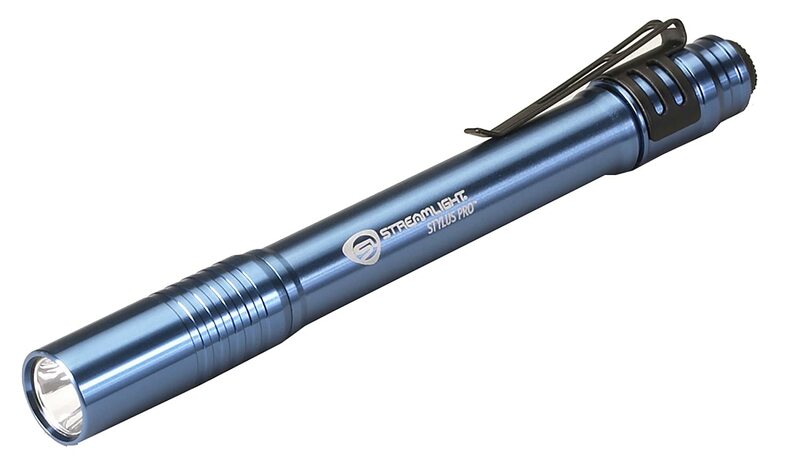 Streamlight Stinger is a type of rechargeable flashlight that makes it different from regular tactical flashlights. To know more about this police flashlight, its material is made of hard anodized aluminum that has an included anti-roll rubber ring. It has an ergonomic feel and won’t slip from your grip. The lens is made of polycarbonate and has proved from time to time that it is scratch-resistant, indestructible, and water resistance. For you to know, it has an impact resistance of up to 1 meter and IPX4 water resistance rating. Streamlight uses C4 LED technology that is superior to most high-intensity LED bulbs. Having a lifespan of 50000 hours, the LED bulb used by Stinger has a maximum beam brightness of 640 lumens with a corresponding runtime of 1.5 hours. 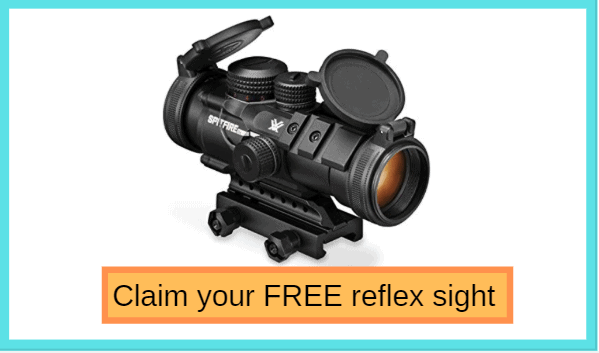 It’s blinding to the eyes and recommended for tactical use. Moreover, the deep-dish parabolic reflector provides a concentrated beam light up the surroundings brightly and can reach hundreds of meters ahead (640 lumens can reach 297 meters). There are two independent switches for this police flashlight. One is found at the head and the other one at the tail. For the latter, the switch is recessed which makes the product capable of the tail stand. Single click activates the on/off function and holding the button cycles to three different modes. This setting makes it possible to turn the light off without going through the laborious sequence. There’s also a strobe mode that you can activate by clicking the button twice in succession. It can be accessed despite any mode. The strobe will be functional for emergencies and send distress signals. Streamlight Stinger comes with a piggyback charger that is akin to docking stations for phones. The contact charging point for the flashlight is found on the opposite side of the switch found at the head. There’s an elevated triangle, and you only need to mount it to the charger until it locks in place. Charging takes 12 hours (steady charging). The battery used can either be NiMH or NiCd and good up to 1000 recharges, this function makes it become the best duty flashlight for you to pick. Long time to get full battery charging because of big battery, but you will get a longer on light time. Streamlight Strion brings you a dependable light that can be an EDC and for tactical use. It’s also different from regular flashlights because it is rechargeable and comes with its personalized charger. Rechargeable flashlights save you money in the long run. The body of Strion is made of anodized aluminum that is durable and lightweight. It’s for heavy duty use, and you can depend on it to be a weapon because of the size. It has a knurled design for secure grip and so it won’t slip when your palm is sweaty. The anti-roll head makes the flashlight steady when placed on a flat surface. One more thing for the exterior is the use of Borofloat high-temperature glass lens that is both scratch-resistant and sealed so that water won’t get in. Strion has an impact resistance up to 2 meters and IPX4 water resistance rating. The C4 LED technology that is superior to other LED bulbs is applied to this police flashlight. It is impervious to shock and recoil. The beam produces smooth and wide due to the deep-dish parabolic reflector. It produces a light of 500 lumens with a runtime of 1 hour for high mode, 250 lumens lasting 2 hours for medium mode, and lastly, 125 lumens for 3.5 hours in low mode. 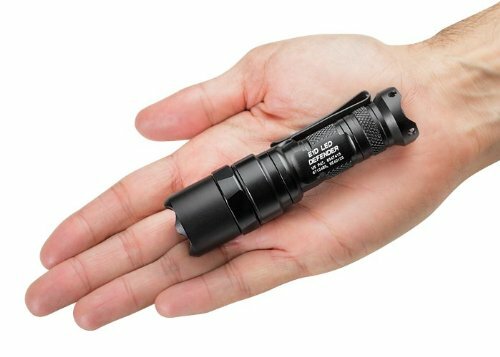 With no doubt, this is one of the brightest police flashlight in 2018. As for the activation switch, it is found on the tail cap and operates with just one-hand clicks. It is capable of constant on and momentary on functions; the latter can be accessed by partially depressing the button. By the way, the button is not recessed inward, so Strion can’t do tail stand. The mode of operation of cycling to three modes is the same as with Streamlight Stinger. The same goes with its strobe function. Charging Strion is quick in just 3 hours. A charger is included upon purchase, and you just have to dock the flashlight to charge it. Contact points are located at the head and easily distinguished because of the elevated triangle. In normal circumstances, the Li-ion battery can last up to 1000 recharges. 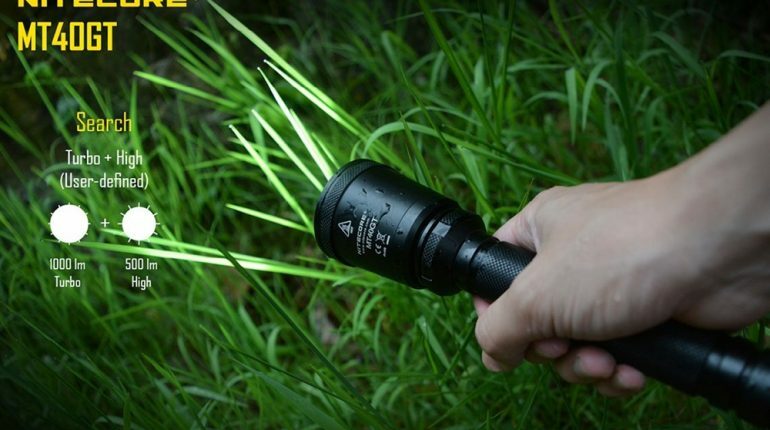 With all of above detail, this one is truely best patrol flashlight for you. Does get warm for long period of use but this is not big issue. This flashlight by SureFire has qualities that you look for in a tactical flashlight. Not only durable and reliable, but Defender is also capable of being a self-defense weapon. The first thing you will notice is the unique design on the bezel. Called as Strike Bezel, it is capable of sending blows that are more reinforced due to the aggressive-looking bezel. Made of high-strength aerospace aluminum that is anodized according to Military Specification or Mil-Spec, SureFire brings you a tactical flashlight that is tough, impact resistant, and has certain water resistance. The bezel is protected by the scratch-resistant tempered glass window that maximizes light distribution. Defender also has a two-way pocket clip. ​SureFire Defender is good on many things, but one obvious setback is the pocket clip. It is prone to breaking because the metal used is thin and not the same as the body. The LED produces a beam at a maximum of 500 lumens through the TIR lens for a more concentrated focus with a sharp cut-off. Its runtime is 2.25 hours. There’s also another mode which only uses 5 lumens and lasts up to 68 hours. Indeed, the maximum brightness can search up an area thoroughly and can be blinding to someone else’s vision. The switch is located at the tail cap. The way to use it is to depress the button thoroughly until you hear a click sound for constant on, and press for momentary on. Upon clicking, the light mode is set to high. To change to low mode, just click it again to off and click it again quickly to select low. The batteries Defender use are two CR123A lithium batteries that have a 10-year shelf life. Shorter on period of use in comparison with above flashlight. Howvever it;s enough for you to have a nice trip at night. J5 Tactical V1 – PRO 300 is the formal flash light of Joe Gibbs Racing and the Number 19 ARRIS Toyota Camry cars by Carl Edwards. The J5 flashlight line has the ultra LED light, and it could run long hours a day with the single AA battery only so that you do not need to charge the power all the time. Additionally, the V1 feature will offer you several functions such as changing the range – zoom for enormous joist or improve the illumination level, scanning the light in the length of two football fields at night due to the incredible beam, having a single battery platform (the single AA battery), three different categories usage – high, low and strobe one. It also has a momentary function in the on and off button in the rear of light which has a latch to operate. Please keep in mind that the button could be pushed or locked at any time, so you should be careful when using. As a result, the J5 Tactical V1 – PRO 300 is the best police flash light which you should take into account the best police flashlight right away. This patrol flash light has the waterproof. Three different modes of light will provide you many kinds of situation. The price is affordable for most of the patrons. It is easy for using and bringing. It has a smooth and practical model. The internal lenses has a small scratch. If you have large hands, then you might get a little stuff with the light to carry on hands. Users need to buy the extra battery as it does not include in the package. Best Under Control TACTICAL Pen has some tremendous features such as a LED light, the DNA defender, a glass breaker, one belt clip and a space pen. It means that this is not only a flashlight only, but also it is a vertical self – defense tool for most of us to carry out. With 6.5 inches in size, it is a perfect size for every bag and pocket for multi – functional. On the one hand, the product is lightweight and comfortable to adjust and use at the same time. You are able to buy this tool for your family members and your friends to solve the dangerous situations without getting the barrier from the regulations. How about the controlling the tool? You do not have to concern as the producer also has released an included video to help you how to use the Best Under Control TACTICAL Pen and handle it smoothly under circumstances. 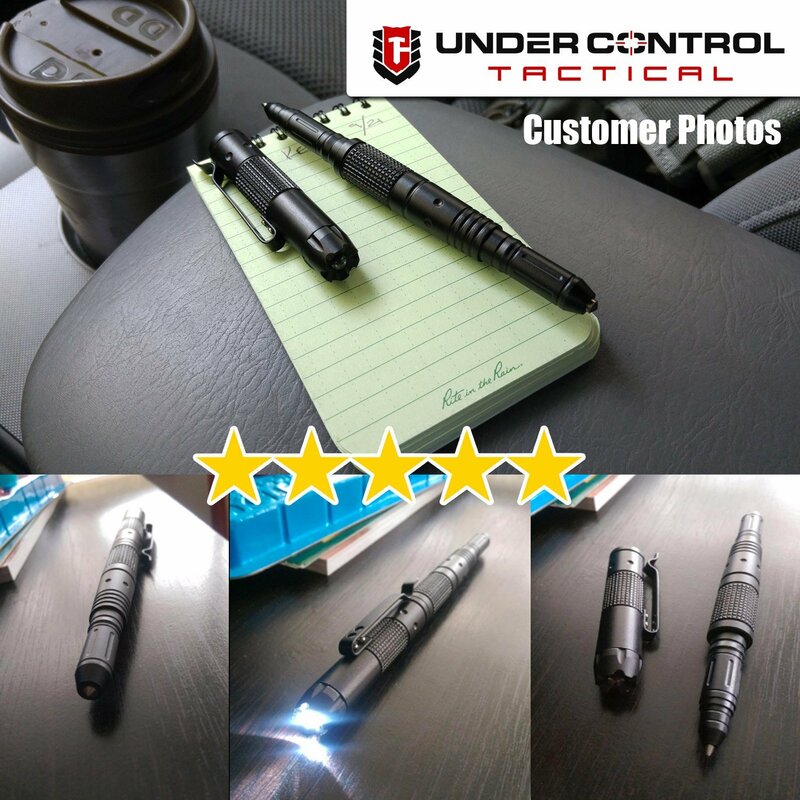 With full of unique features, the Best Under Control TACTICAL Pen is also rated one of the best police flashlight in the latest market. The product is a versatile usage to be a self – defense tool. It is lightweight and appropriate size to carry out. It could break other purpose like a car. It is easy to handle and keep. The customer service of the manufacturer is incredible. The tool should have an extra cap screw to control the pen clearly. It is not easy to open the flashlight for the first time as it is a little tight. The flashlight should have a button to turn on or click it like a real pen. 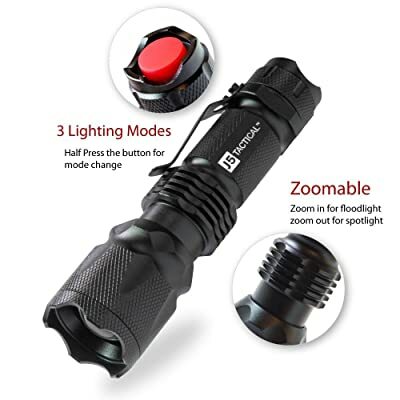 Zglon Ultra Bright Rechargeable LED Tactical Flashlight has the T6 LED Chip feature with the 18650 lithium – ion battery with the 800 lumens wattage as well to remove the darkness and take away your fear. Additionally, the flashlight has the front head telescopic to adjust the close distance or longer depending on your needs and wants. Even if your target keeps far away from you about 600 feet, the product could solve this problem quite well. Because of the high – quality aluminum material, the product increases the durability, the comfort and other outside protection like the waterproof and the skid-proof. Whether you want to get the product for self – defensing, hiking, attending the outdoor activities, fishing, etc. it is still a power bank to carry out in your journey as the flashlight has total 7 LED bulbs to meet your requirements. Hence, we could not be surprised that the Zglon Ultra Bright Rechargeable LED Tactical Flashlight is the best police flashlight to hook it right away. The patrol flashlight is easy to grip and use. It does not require the complex battery to use and charge as you need to take the AAA+ batteries only. You just need to put a USB cable to charge the batteries. It has an appropriate size to carry out. It is not heavy and bulky. The light is powerful with seven inbuilt bulbs. The shipping time is so fast. The button on the flashlight does not work well (you should push the front button and open the side light). The Streamlight 8840 ProTac HL has the C4 LED technology to expand the time used up to 50,000 hours with three different modes of using – high platform only, high plus low plus strobe, and the combination between low and high structure. With the high level of the light output, you enable to get these technical numbers: 750 lumens maximum radiance, 18,300 – candela joist potency, 270m joist interval with the running time gets an hour and a half. With the low level of the light output, the radiance is 35 lumens, the joist potency is 900 candela, the joist interval is 900 candela and the running time is longer (18 hours). With strobe level, the running time catches 2.5 hours only, which has the IPX7 waterproof for 30 minutes. The flash light could get these levels significantly because the two CR123A batteries are made from the lithium. On the flip side, the nylon outside covering increases the comfort while handling. The function of the flash light is incredible. You enable to use it in every situation. It is easy to use and bring. The price is reasonable for its features. It is a great self – defense tool. The light is quite small for large hands. The including battery is not endurable for long hours. The battery area will be hotter while charging. Supernova Guardian 1300 XL Tactical Flashlight has the CREE XM-L U2 LED in the bulb to improve a sweltering brightness and a bigger area for polices and military professionals. Additionally, a remarkable lighting distance of 3000 yards boosts the public eye on the outdoors when hiking, camping, hunting, fishing, etc. 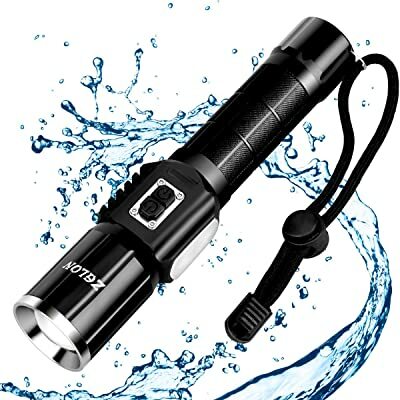 On the one hand, this flashlight is made from the brushed aluminum material with the waterproof covering to withstand the harsh conditions no matter how the weather is. The handle coating is also inbuilt against the slip – resistance so that you could hold the grip easily on the hands or you keep it in a place to control the handle while driving (or doing the same thing). Supernova Guardian 1300 XL Tactical Flashlight is rated one of the best police flashlight for self – defense tool as it has total protection modes – High, Medium, Low, Strobe, and SOS modes with the Bright Start Memory Technology as well as the remote switch element to provide multipurpose for hunters. The patrol flash light has the SOS feature to make an emergency signal for finding the supporting. It could divert the threats thanks to the Strobe Mode and the Strike Bezel. It is strong, solid and good – looking. The battery is also endurable for long hours. The battery is not suitable for a quick access. You should take both hands to turn the light on. Police flashlights, or largely known as tactical flashlights, are suitable for both every day and hazardous situations. Other than the main benefit of identifying threats, they also provide brighter light that can temporarily blind or confuse the enemy’s vision. The person would then react instinctively and cover his eyes. By then, you have the chance of taking advantage of the situation, or you can opt to flee. A common feature of police flashlight is the strobe. Strobe functions when the light blinks rapidly without clicking the button repeatedly, but only through a set mode. This kind of setting is advantageous as you can disorient the enemy’s attacks and the effect will be the same as illuminating light with high lumens to the person’s eyes. Tactical flashlights can be used as a self-defense tool, too. With other name, this article is showing you to choose best flashlight for law enforcement. They don’t attract attention as much as deadly weapons like knife or guns. However, they can be good blunt weapons because of the hard and durable material they were made. Those models that have special designs at the bezel are good for striking motions. Even if you don’t belong to the police force or the military, you can acquire the flashlights they use in most stores. In order to find the best duty flashlight, first, you need to know what the characteristics you should consider are. The size of the flashlight is the first thing to consider. Whether you want it as keychain flashlight or pistol light, anything goes as long as it fits into your palm. You don’t want a flashlight that is bulky. The right size which you should get is that it can be pocketed in your jeans or jacket. So the size is very important to consider before you pick the best law enforcement flashlight. All tactical flashlights of today are made of LED. Incandescent bulbs are still available but not for tactical use. Latest LED bulbs of today have a lifespan of about 50000 years. Another advantage of LEDs over incandescent bulbs are the ridiculously high light output. The color of the LED bulb is one of the things you need to decide on. As for police flashlights, white light is highly preferred because of its brightness capabilities to disorient the attacker or enemy unlike when you use yellow light. Like all other flashlights, the brightness of the light must be primarily considered. But for tactical flashlights, the rule is to choose those that have lumens of more than 100. Lumens is the measure of brightness intensity and easily influenced by the type and number of batteries used. The distance covered is also influenced by how bright the light is. The higher the lumens, the farther the reach of the light will be. Beam distance is measured in meters. Why is the value of lumens important? If you’re using the flashlight for tactical use, then you will have to resort to using it to impair the vision of the opposing party. Lumens below 100 won’t be of any help to identify the threat nor enough to control the situation. Advanced flashlights have different brightness modes that can be switched easily or not depending on the program. Most of them offer at least three modes e.g. high, medium, and low. Note that the higher the brightness, the lower the runtime. So it’s recommended not to use the high mode for straight hours. Tactical flashlights have special functions like a strobe. Accessing the strobe depends on the chronology of clicking in sequence, but sometimes it is a hidden function. Having this can be pretty handy because you can send distress signals or confuse the enemy to make your escape. Since police flashlights are aimed for tactical use, the material must be heavy duty and durable. As a blunt weapon, your flashlight should be as hard as it could be. Hard anodized is the top choice as it’s lightweight yet very tough. A toothed bezel is also welcome so you can make striking motions when engaging the enemy. Getting a waterproof flashlight is also equally important. Not entirely waterproof, but the light should be able to resist water to function well. You will need to make your flashlight usable in all conditions. Choose tactical flashlights that have ratings from IPX4 to IPX8. The battery used the most crucial part of picking the best flashlight for law enforcement. That is because the batteries can affect the light output, runtime, weight, etc. First, you need to decide on is whether to get disposable batteries or the rechargeable ones. AA, AAA, and CR123A are the most common batteries for disposable batteries. However, the latter can be hard to find. In this case, you need to factor in the availability of the power source. It can easily be solved by buying bulks of them ahead of time. CR123A also provides brighter light because of higher voltage output compared to other types. Rechargeable batteries save you money in the long run such as the Li-ion. Now you are more than ready to buy your own tactical flashlight based on our buying guide and best flashlight reviews. Getting the best police flashlight is one of the best things you have done as you improve your chances of being able to defend yourself in one way or another.